Asante Kotoko scraped through to the second round of the African Champions League after being held to a goalless draw by Ivorian champions Asec Mimosas in Kumasi. 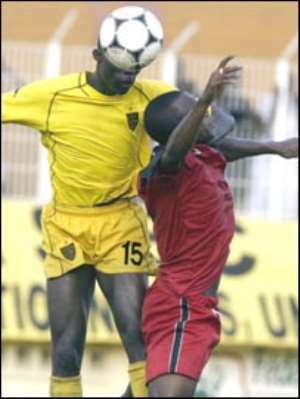 Kotoko thus go through on the away goal ruling, after the two teams drew 1-1 in the first leg in Abidjan. The Ghanaian champions looked out of sorts for the most of what proved a disappointing game, with Asec striker Alhassan Koivogui proving a constant threat to a less-than-impressive Kotoko defence. The tie became more physical in the second half with six players going into the referee's notebook for dangerous play. Asec striker Vincent Die Foneye thought he had scored a crucial goal in the 73rd minute, but his strike was disallowed by referee Pierre Lassina for an infringement. Kotoko came close to scoring themselves with ten minutes remaining but Frank Osei blasted over from six yards. Asec's first round exit left their coach Patrick Liewig fuming at the disallowed goal. "I'm proud of my players but I can't understand why our goal was disallowed," he said. Meanwhile, Malik Jabir, Kotoko's technical head, expressed his relief over the result. "The game was very tough," he noted. "Asec gave us a good team, but the important thing is we've qualified." Despite the result, angry Kotoko fans could be seen calling for the head of German coach Hans Kodric after the game. Although they were questioning the coach's technical ability, Kodric has guided Kotoko through a tricky tie and into the second round where the Ghanaians will face Algerian side USM Algiers. Fellow Ghanaian side Accra Hearts of Oak also made it through to the next round of the Champions League after drawing 1-1 against Aviacao in Angola. Hearts won the first leg 4-1 and thus go through 5-2 on aggregate. In the Confederation Cup, Cameroon's Sable Batie reached the second round on the away goal ruling after drawing 1-1 with Gabon's USM. Arnold Yembi opened the scoring for USM after 16 minutes, but Hervé Watchueng equalised just after the hour to level the tie at 3-3 on aggregate. Liberty Professionals became the second Ghanaian side to knock an Angolan side out of African competition on Sunday with a 5-1 win at home to Angola's Petro Huambo. The Ghanaians go through 5-2 on aggregate after losing the first leg 1-0 in Angola.